Let’s talk for a couple of minutes about memory. No, not memories, as in I spent quality time with my family and formed lovely memories. I mean digital memory. I know I’m quite young, but no topic in the world does more to make me feel like an old grandma than this one. Let’s go back and talk about my first encounter with digital media. It was seven years ago when I first purchased a digital camera. By today’s standards it was a piece of junk, but in those days it was a top of the line camera. It had 5 megapixels and came with a 32 megabyte card. After spending a bundle on a camera, I didn’t want to drop the additional cash on a larger card. I opted instead to use my 32 MB card and delete after every 13 pictures. I went on that way for a while, until I decided to splurge. I went and bought a “large capacity” memory card. It had 256 megabytes and cost ninety six dollars. And I thought it was huge, practically a miracle. I remember that thrill all over again when I got my first 1 gigabyte card. And the thrill increased each time I got a larger card, one that could hold more pictures. When I got my new camera recently, I got a 16 gigabyte card to go with it. Not huge by today’s standards, but definitely sufficient. It cost me twenty bucks. Why am I thinking about digital memory today? I guess it started when I had a customer purchase a 12 terabyte hard drive. Let’s do a little math now. A terabyte is one thousand gigabytes. A gigabyte is one thousand megabytes. That means one terabyte is the same as a million megabytes. And therefore, a 12 terabyte hard drive (12 million megabytes) is the equivalent of 187,500 32 megabyte cards such as the first one I used. At the rate I paid for my first (256 MB) card, this hard drive would have cost two and a quarter million dollars. Today, however, I sold that 12 million megabyte drive for just over a thousand dollars. Pretty amazing, huh? Next time you buy an 8 gigabyte card for 12 bucks, think about this. Now onto this chicken. I don’t have much to say about it, other than that it’s delicious. And almost too easy. Plus it’s got a veggie built right into it, so it’s pretty much my new favorite supper recipe. Finely dice the onion. 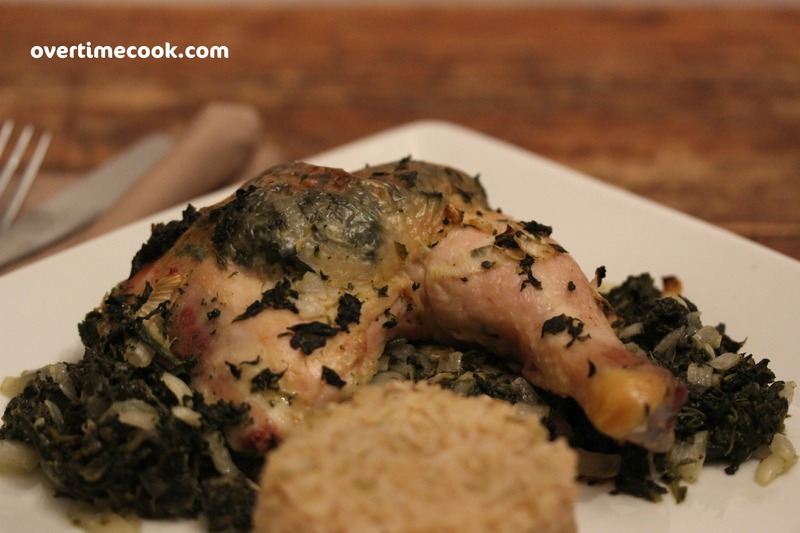 Mix together with the chopped spinach, crushed garlic, lemon juice, olive oil, salt and pepper. Set aside. Clean the chicken and pat dry. 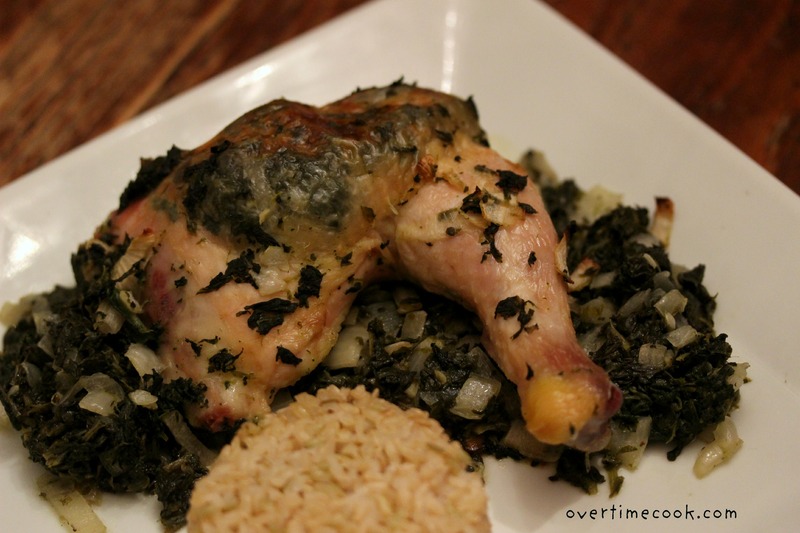 Spread some of the onion and spinach mixture between the skin and the meat of the chicken. Spread the remaining mixture on the bottom of a large roasting pan. 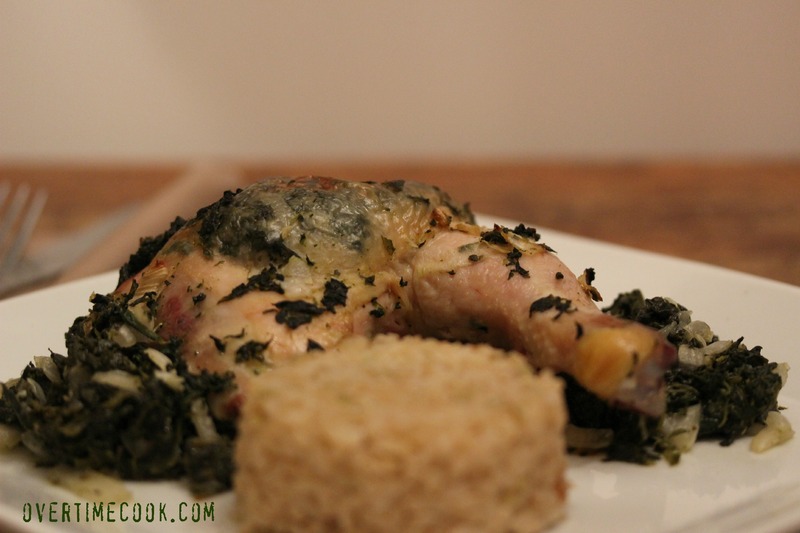 Place the stuffed pieces of chicken on top of the spinach mixture in the pan. Sprinkle salt and black pepper over the chicken. Cover the pan with foil and bake for 1 hour at 375. After an hour, remove the foil and raise the temperature of the oven to 425. Bake for an additional 30 minutes. I did not even know that hard drive memories were being built in the terabytes and I can’t imagine needing one that large. Your chicken dish looks very good. Great! Please let me know how you like it! This chicken was divine! I didn’t know spinach could taste so good. Dirac this freeze well or can it be done a few days in advance? It’s really best fresh. If anything, you can try freezing it raw then roasting fresh.